Meringue Cookies are one of my favorite little desserts to make. They are super easy, and require relatively little to no prep work. 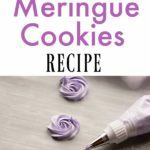 If you are looking for an easy meringue cookies recipe, it’s here! If you have followed me for a while you know that I have spent a lot of time in the kitchen. I have so many fond memories of working in the kitchen with my mom and helping her make cakes. Those memories are probably one of the reasons I love to be in the kitchen as much as I do today. Another thing to note about me is that I also LOVE to make some yummy desserts. I try to balance things out with a healthy meal, but the older I get, the more dessert I want to eat. Ha! Anyone else feel this way? One of my favorite things to do is share easy recipes. I don’t want to spend all of my time in the kitchen, so sharing an easy recipe is at the top of my priorities list. I try and keep in mind that you are just as busy (if not busier!) that I am, and kitchen time should be kept at minimal levels. 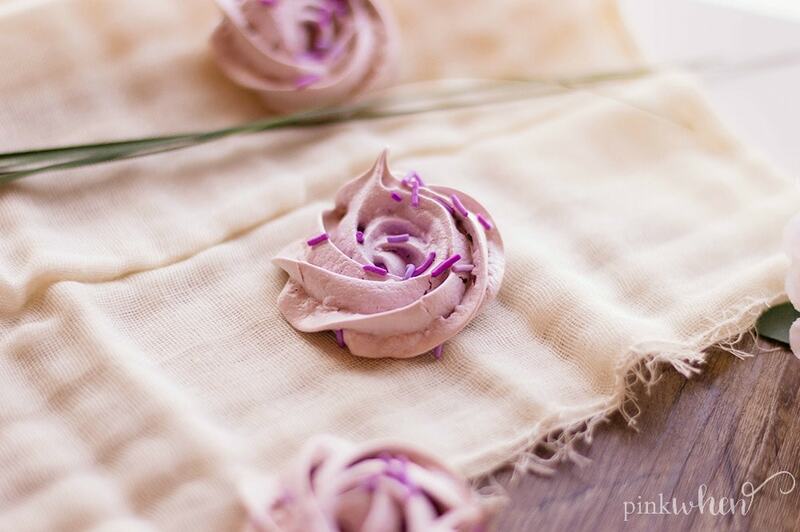 So why am I sharing these meringue cookies with you today? Well, not only are they cute to look at, but they are super delicious! My kids love it when I make them fun sweet treats, and this one is at the top of their list. How do I make Meringue Cookies? Making these 3 ingredient Meringue Cookies is not that hard at all. 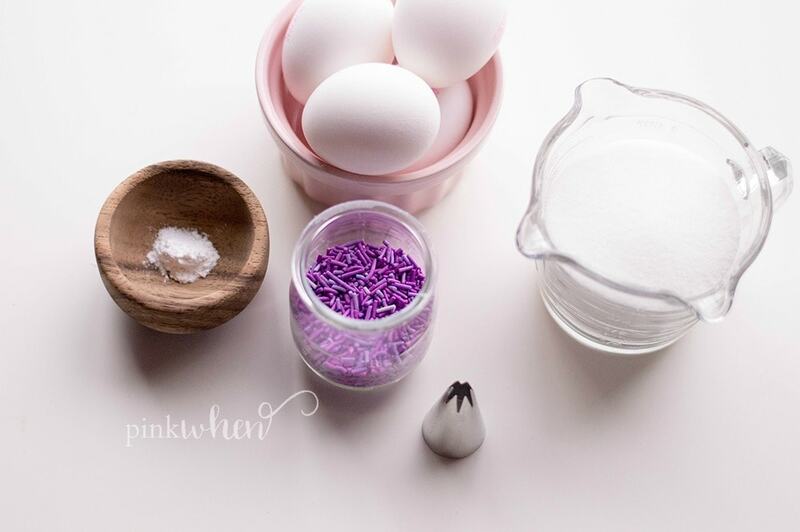 You only need to have eggs, sugar, cream of tartar, and food coloring if you want to make them look super cute. Otherwise you are all set with just those 3 simple ingredients. Just heat up the oven and get ready for a super simple and sweet snack. I hope you enjoy making these Meringue Cookies as much as we do at our house. It’s fun to get the kids involved and see what designs and colors they are going to make next. 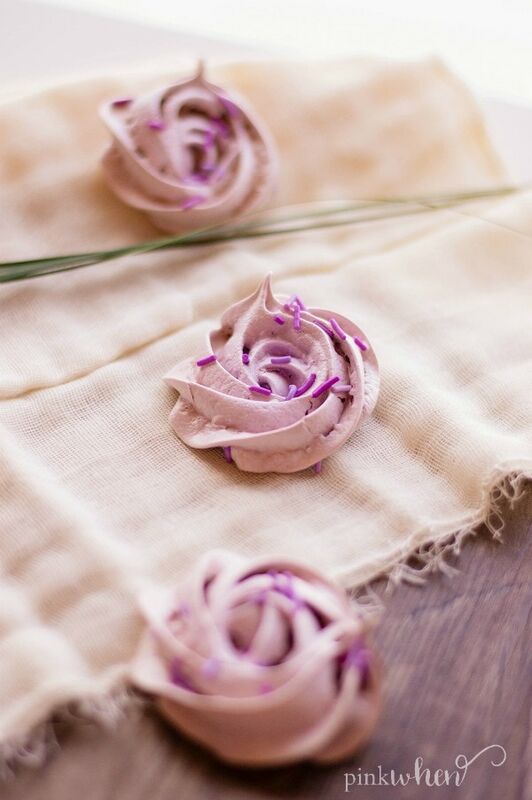 These purple flower meringue cookies look so cute! Meringue Cookies are easy and only 3 ingredients! Preheat oven to 225 degrees F and line a baking sheet with parchment paper (to make your meringue cookies uniform, use a pencil to trace out a circle from a cookie cutter onto your parchment paper). In a stand mixer (or using an electric mixer), start beating egg whites until bubbles form. Slowly start adding sugar and then, add cream of tartar. Mix on high until you achieve stiff peaks in your meringue mixture. Add 1-2 drops of food coloring (depending on how deep you want the shade) and mix. 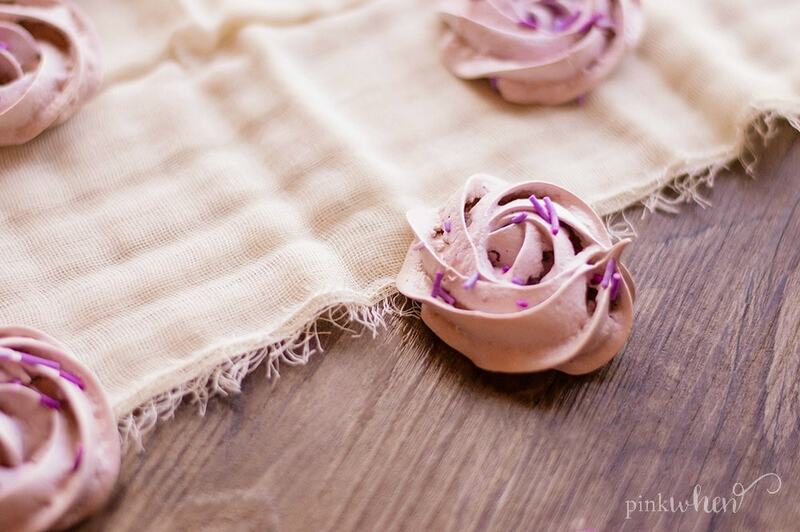 Place meringue mixture in a piping bag with your 1M piping tip. 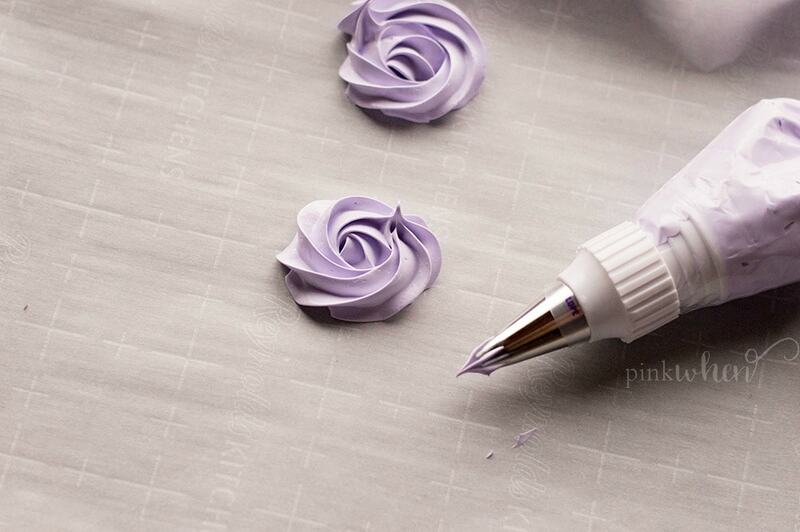 Start in the middle of each of your circles on your parchment paper and pipe rose shapes. Garnish with your sprinkles. Bake for 45 minutes and then keep in oven for one hour (without opening oven door). These are gorgeous and delicious!